July 19, 1999 . . . . I cut a piece of rosewood left over from cutting out the back, and made an end wedge. Actually, it's not a wedge-shape --- it's a simple rectangle. 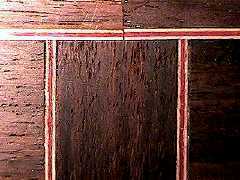 The white/red/white wood purfling is used once again here. July 22, 1999 . . . . Here's a close-up of the back binding and purflings after they've been glued in and scraped. I used superglue to first glue in the back purflings on their ledge (when I've used Titebond, the purflings tended to swell too much). 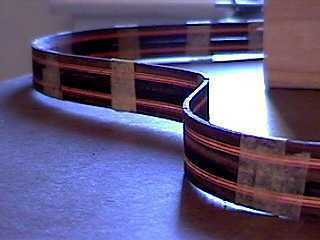 Then I glued in the binding (which already had the side purfling attached), using Titebond. 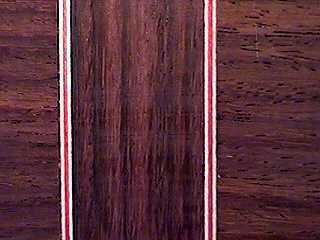 In between the two black/white/black strips is a 1/16" wide teflon strip. This will be pulled out to form the channel for the abalone strips. 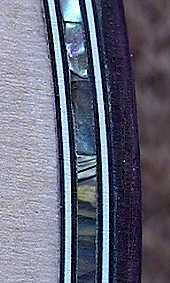 To the left is another view of the bent bindings, next to the side bender. 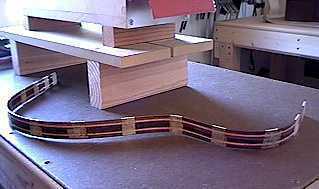 Here's where the end wedge and side purfling meet, at the tail end of the soundbox. July 28, 1999 . . . . Here it is: the abalone top purfling has been glued in and sanded down level.